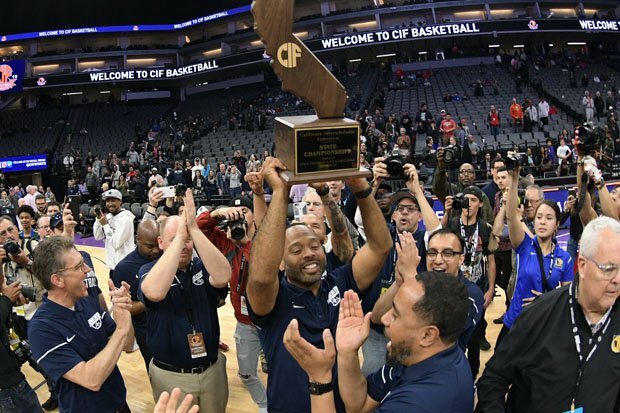 SACRAMENTO, Calif. — The Sierra Canyon (Chatsworth, Calif.) boys basketball season finale was a slam dunk. The nation's No. 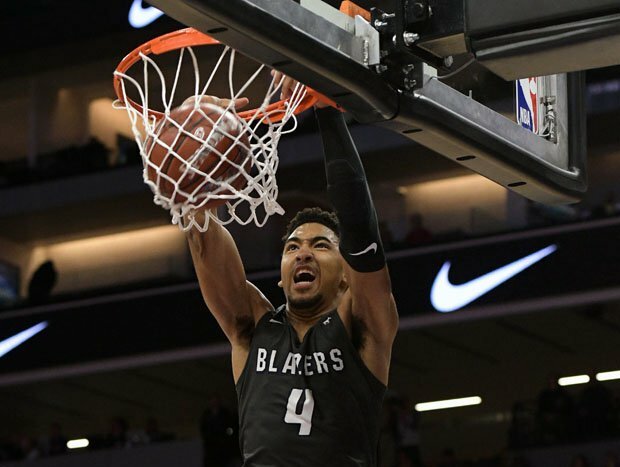 6 team threw down 12 dunks, four by Kenyon Martin Jr., who scored a game-high 23 points, and two spectacular flushes each from Cassius Stanley (20 points) and sophomore Amari Bailey, in a wire-to-wire 76-52 blowout win Saturday over hometown Sheldon (Sacramento) in the CIF Open Division finals at Golden 1 Center. led the girls to their first Open state crown. "I was emotional and in tears watching her play," he said. "But afterward, you blow it out and it's game time. I didn't have to say anything special to the boys." For many of the seniors, this was the final act of one of the nation's most viral, successful and active shows. The roster is filled with sons of former NBA stars and its fan base regularly features Hollywood celebrities. Though their play was sloppy early on — Chevalier said a slick new basketball contributed to turnovers early — the Trailblazers' final act did not disappoint. Martin made 10 of 17 shots and added 12 rebounds, and Sierra Canyon connected on 31 of 65 shots, mostly in the paint. 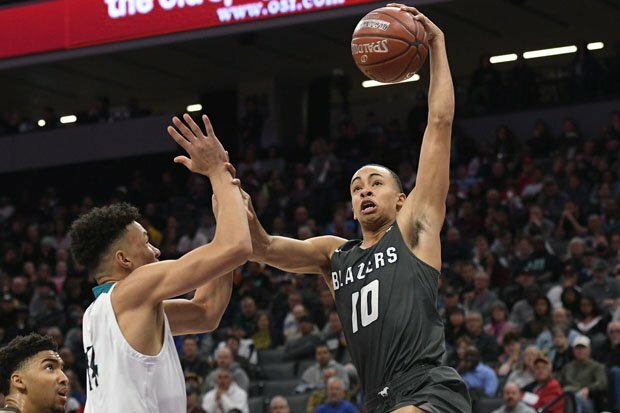 It was the second straight championship win for the Trailblazers over Sheldon (24-11), which got 17 points by Marcus Bagley, the brother of Sacramento Kings' rookie Marvin Bagley. Sierra Canyon dominated Sheldon on the glass with 50 rebounds to 25 for Sheldon. Scotty Pippen Jr. son of NBA Hall of Famer Scottie Pippen, finished with six points and a game-high seven assists. Kenyon Martin Jr. had a game-high 23 points and four dunks. Martin said his team needed no motivation speech to get going even after a exhausting rout through the Southern Section and Northern California playoffs. "We just played our heart out," he said. "We didn't play our best at all. We had too many turnovers. But we played hard and we wanted to finish strong." They did that, especially Martin, who put down three follow dunks. The dunk of the night was Bailey, a 6-4 freshman, who extended his left arm, went high above the rim and sent the ball down while being nudged. He fell flat on his back, causing a giant grown among the 6,013 fans in attendance. He got up and played 15 minutes, made 4-of-5 shots and scored nine points. When asked if he realized that he put down the dunk of the game, Bailey said: "I don't even remember it," he said. That drew a giant laugh in the media room. Sierra Canyon freshman Amari Bailey goes up for the dunk of the night, before taking a hard fall on his back. Stanley, the high-flying 6-5 senior, who finished with three state championships, one with Harvard-Westlake said last year's championship was different because "We were just trying to prove to everyone we weren't just a circus," he said. "This year there was pressure to prove that last year was no fluke." Coach Chevalier, exhausted from his involvement with both games and the long season, said it was harder to repeat than last year. "The road through pool play in the Southern Section was a monster," he said. "I'm exhausted. The boys aren't exhausted because they're teenagers." Chevalier said he gave Saturday's performance a "C-minus," because of all the turnovers. But he gave them an "A" for finishing. Sierra Canyon boys coach Andrew Chevalier holds up the Open Division trophy for a second straight year. The culture of Sierra Canyon is a blessing and a curse. The pressure to keep up with the nationally ranked boys basketball, girls volleyball and football teams — among others — can be immense. But girls basketball coach Alicia Komaki relishes it. It led to the team's fourth state championships in four tries, but first since 2015. Behind 20 points and seven assists by Chevalier, the Trailblazers, ranked 14th nationally by MaxPreps, won their first in the Open Division. They also got 17 points from Vanessa De Jesus and 15 points and eight rebounds by Amanda Olinger. "The support we get from the administration and the success on campus is amazing," Komaki said. "But it had been three years since we last won a title. I was feeling a little uneasy. I always am pushing for our individual best.. ... I told them before the game that they were a special group. They went out and showed it." The Trailblazers (33-1) outscored the Panthers (27-4) in every quarter to win going away. They had beat Pinewood 47-33 in 2013 to win the D5 finals. .Besides playing at the top level, this game was much different, with plenty of offensive fireworks, including 17 points from Pinewood sophomore Annika Decker and 12 by Kaitlyn Leung. 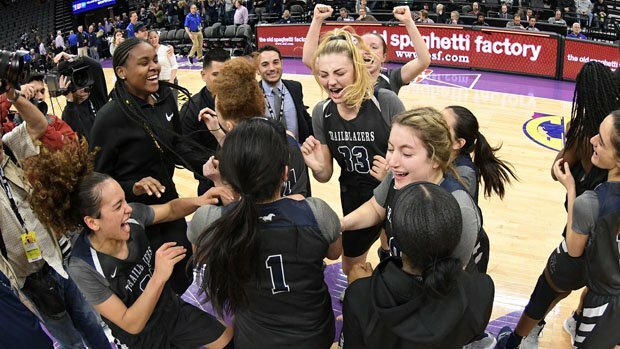 The Panthers couldn’t get seniors Klara Astrom, who had 27 points in the NorCal final, or Stanford-bound Hannah Jump into the flow. They finished with a combined 15 points on a combined 5-of-15 from the floor. Both were battling nagging injuries, but Pinewood coach Doc Scheppler offered no excuses. Pinewood cut double digit leads to 31-25 at halftime and 50-42 early in the fourth quarter, but the Trailblazers, ranked 14th in the country, always had an answer. It usually involved Chevalier and Angela Bacoulis and De Jesus, who made three three-pointers each. So will the Trailblazers, who made 28-of-61 from the floor, including 10-of-26 on three-pointers. They committed just nine turnovers and out-rebounded Pinewood 40-32. "I'm here to push them to be the best team in the country," Alicia Komaki said. "I told them them before the season that they're the most talented team I've ever coached. But they were also the softest. (The second part) wasn't true, but I was trying to push them." 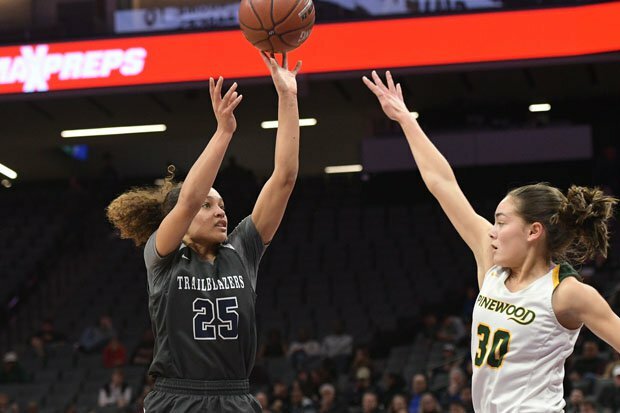 Sierra Canyon celebrated its fourth state championship, but first in the Open Division.